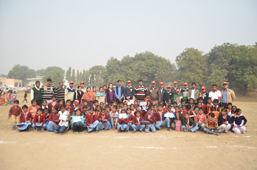 Bry-Air CSR team organized Sports Day at the sports Ground Literacy India, in Baghera Village on December 18, 2013 for Bry-Air Pathshala students. Near about 150 students participated in the event. The program consisted of many events like-Spoon Race, Relay Race, Three Legged Race, 100 Meter Race, 50 Meter Race and Football Match. The children who secured First, Second and Third position were awarded with medals & certificate.